When should We trim a Hedge? Is there anything more joyful and pleasing to the senses than seeing a neat row of hedges all tightly lined up? As tree and plant enthusiasts, we have to say no. Neat, symmetrical hedges help keep a home and property looking tidy, and are a reflection of the care and dedication you have to maintaining your home’s appearance. Just like the investment you make in trimming your hedges is a reflection of your pride in your home, the job that Rock’s Tree Service does is a reflection of the pride we take in being one of Ottawa’s leading tree service providers. Anyone can show up and try to tame the wild mess of brush lining your property, but few do it right, and none do it with the level of care and attention that we use. Rock’s has over 15 years of experience working in the industry. If you’re in need of fast, affordable, and thorough hedge trimming in Ottawa, then trust no one but the best! 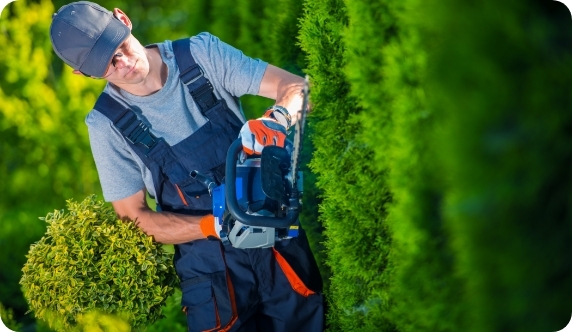 Our experts are trained in the correct pruning technique for whichever types of hedges or foliage that you have around the home, so whether you are looking to spruce the place up for an outdoor party in the summer, trying to reign in the summer growing season and tame the hedges, or looking to sell your property and want to increase your curb appeal, trimming the hedges is not something you should trust to anyone but the pros. With more than a decade of experience in the industry and a track record of satisfied customers throughout the local area, Rock’s Tree Service provides hedge trimming services in Ottawa performed only by trained and dedicated experts. Want to make your hedges look better than they ever have before? Contact us today!